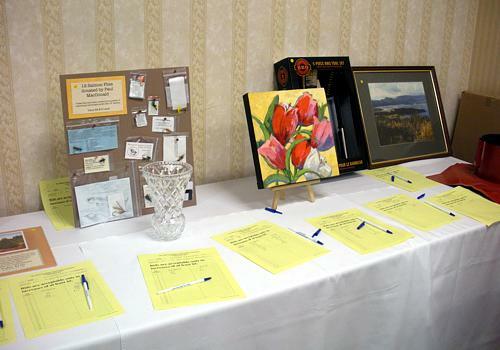 ITEMS FROM OUR 2010 LIVE AUCTION! We are very pleased to report that the Mahone Islands Conservation Association's 2010 Annual Gala Dinner and Auction (GDA) was another overwhelming success. 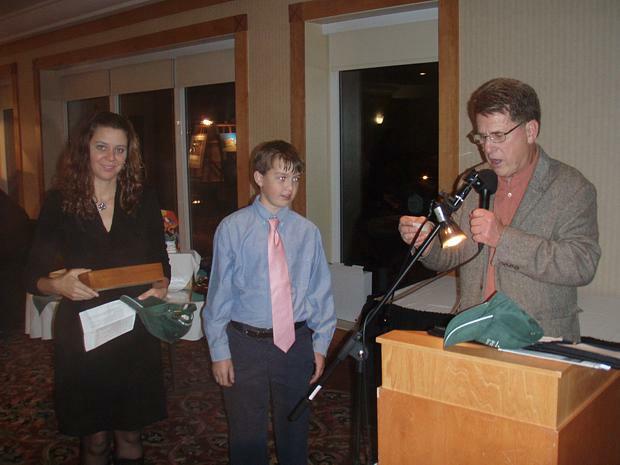 The fund raising event, which was held on October 29th at the Atlantica Inn was sold out. It generated over $45,000 which is another record! These funds will be used towards future acquisition projects. MICA directors offer a sincere thank you to all the donors, supporters, volunteers and 260 guests who made the evening such a success. The work of GDA Co Chairs Brom Hart and Georg Ernst together with their dedicated, hardworking and enthusiastic committee (Sherrill Harrison, Sharon Isnor, Sidney Lang, Margaret MacDonald and Jeannie MaLean) produced a very well organized event that again exceeded everyone's expectations. Our ticket coordinator and GDA Committee member Nikki Ernst spent countless hours making sure all the tickets were sold and the tables were suitably arranged. Anne and Bryan Palfreyman graciously provided their house for meetings of the GDA committee and for assembly of the auction items. The evening began with music by Dr. Laurie McNeil acompanied by Rick Knowles, followed by Piper James Parker who officially got things underway. 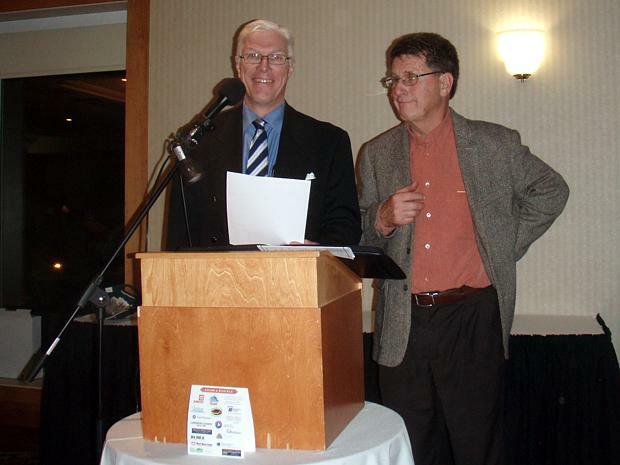 MC David Nicholson, a past Director, expertly kept things rolling along and on schedule with the help of auctioneer Blain Henshaw. MICA Chair John Meisner thanked our corporate sponsors and provided a brief background and update. He also expressed consolences to the Eisenhauer family on the loss of Andrew, a strong MICA supporter and one of our first life members, who passed away the day before as a result of a fall. One of the highlights of the evening was the presentation of the MICA Award to Mr. Rudy Haase of Chester, for his contribution to the Association and his decades of conservation efforts throughout Nova Scotia. The Award was presented by Sherrill Harrison of the Board of Directors of MICA. We express our gratitude to our corporate supporters, this year numbering 19, who were a very large part of the financial success of the evening. Please refer to this link for a listing. Thank you to David Nicholson for his work and great results in this area. We thank the many other MICA members and friends who assisted in the evening's activities including Jeff and Jacquie Avery, Daniel and Steven Baker, Anne Bailly, Martin Balcome and Miriam Meisner, Alan Boehner, Abe Croft, Thomas Dauphinee, Kris Ernst, Mike Ernst, Debbie Fraser, Don Fraser, Marilyn Hart, Robert Hazel, Malcom Mann, Janet Meisner, Ron Myers, Ruth Anne Nicholson, Susan Pratt, Ches and Ruth Roberts, John Swinamer, Sherry Swinamer, Ruth Taylor, and all the MICA Directors. We express our sincere thank you to you for your great work. All in all, another great success story for MICA and we offer our sincere thank you to all who contributed to this event. 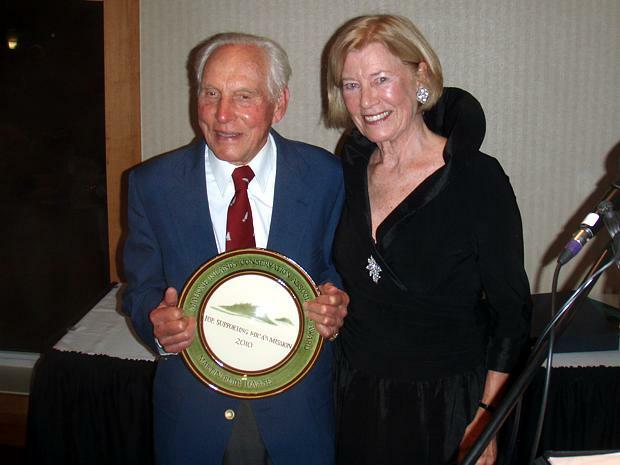 One of the highlights of the evening was the presentation of the MICA Award to Mr. Rudy Haase of Chester for his lifetime of conservation activism and for his support and contribution to the MICA mission. The award was presented by Sherrill Harrison, member of the Board of Directors and Chair of the Public Relations and Membership Committee. 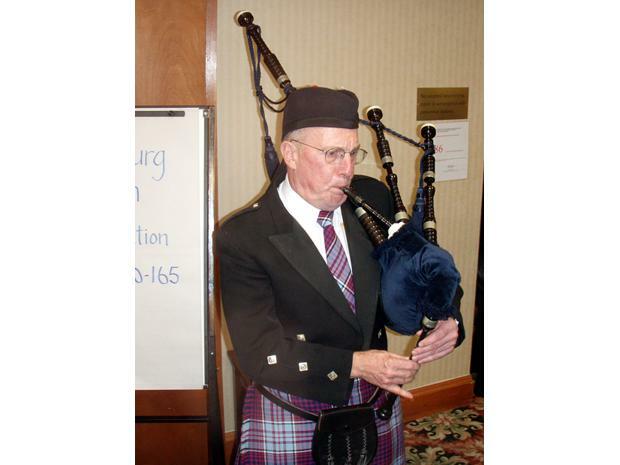 Piper, James Macfarlane pipes in the guests to dinner. 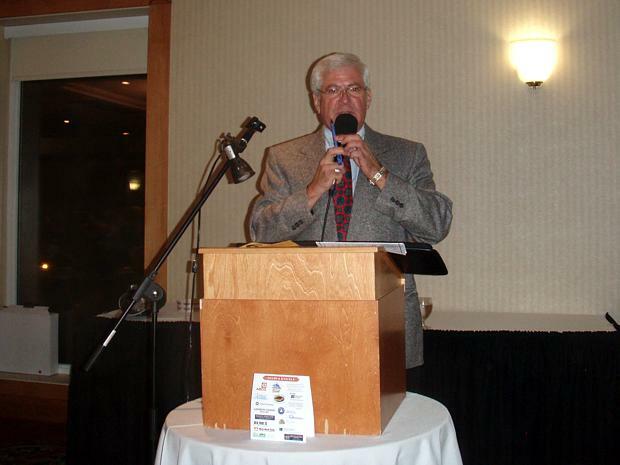 Blaine Henshaw was the Auctioneer for the Live Auction and did a phenomenal job of getting the guests to "loosen" their pocketbooks! 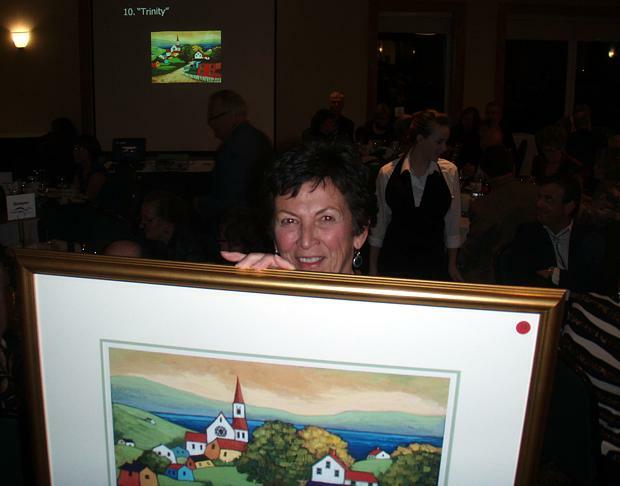 Sherry Swinamer, parades through the guest dining room displaying one of the most successful of the Live Auction items"Trinity", a limited print by Carol Ann Shelton. On the left, Master of Ceremonies (and a former Board member) for the evening, David Nicholson who along with Brom Hart, Co-chair for the Gala kept the evening running smoothly. Jeannie McLean, Malcolm Mann, volunteers and Brom Hart, Gala Co-chair, draw for the raffle. 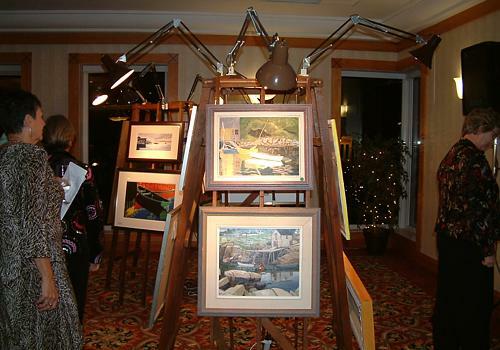 Visual art, entertaining services and ways to "Experience The Islands"